She's got brains, beauty and a badge. 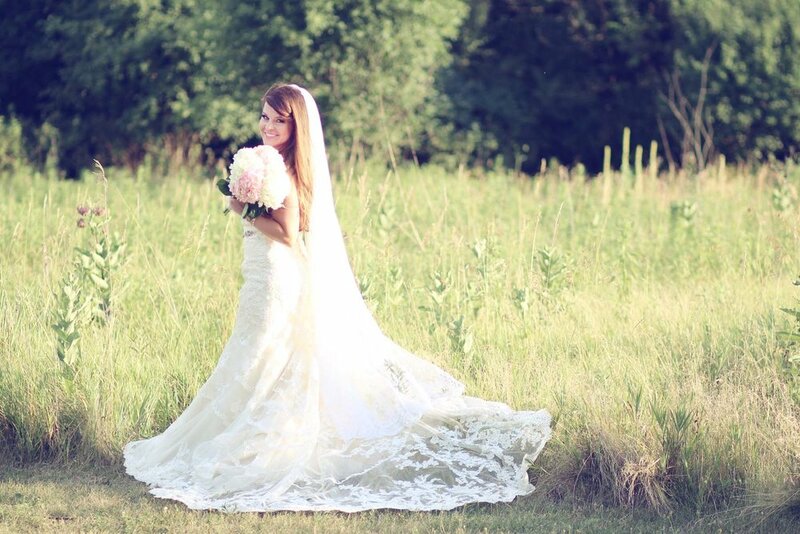 Meet our amazing bride, Alison! Alison traded her police uniform for a gorgeous, light gold Allure Bridals gown paired with a beautiful J. Picone belt. We loved this combo on her so much! Doesn't she look amazing?! Love the squad shirts she wore with her girls! Before walking down the aisle, Alison's parents had a major surprise in store for her. Since both Alison and her new husband Andrew are police officers, a vintage police car was waiting outside to take her to her wedding. The ceremony took place at St. Elizabeth Seton Church in Orland Hills. Alison carried a gorgeous bouquet of roses and peonies for her walk down the aisle. The reception was held at Silver Lake Country Club in Orland. There were lots of little details throughout the party honoring the couples' profession. The best part? Their donut tower! Want to see more? Check out their super cute wedding video by Ojo Creative! Despite what you may be thinking, the newlyweds didn't meet at work. "We met at a birthday party for my future sister in law. My friend asked me to come and he was there. We started talking that evening and were inseparable ever since." When it was time to propose, Alison knew Andrew had something up his sleeve! "We were visiting my Grandma in Naples, FL and we went out to a fancy dinner downtown where he proposed. It was supposed to be a surprise but I could tell something was up. Usually when we would go out to dinner, he was always pretty focused on what he was ordering and eating whatever they put on the table. He especially would always eat bread and butter. When they brought out these amazing compound butters and he wouldn't touch them, I just knew it was coming." The food gave it away! Speaking of food, Alison's favorite part of planning her day was choosing which sweet treat they would serve their guests! "My favorite was deciding to have donuts instead of cake. The place we chose (Home Cut Donuts in Joliet, IL) gave us every donut they had to try for a taste test and we got to decide which ones we wanted. It was delicious and for sure our favorite part. We cannot wait to celebrate our anniversary every year with our favorite donut!" How cute is that? Who doesn't love a good donut?! What was Alison's least favorite part of the planning process? "The seating chart for the reception is definitely a difficult task, we had about 320 people at the wedding. Trying to arrange everything, then running it past our families to make sure everything was okay was also pretty nerve racking. We kept having to reorganize it!" The big day had arrived. What was Alison's favorite part of the whole day? "Our favorite part of the wedding was most certainly when we went back to our house and took photographs with our three dogs: Lilly, Lucy and Lexi. Each one had a little floral arrangement on their collars and were so cute." "We started planning 2 years in advance which definitely helped relieve a lot of stress. I really don't know how some couples plan a wedding in a few months. It helped that the date we had originally wanted was taken so we got to spread a lot of tasks out and it wasn't as overwhelming as we had thought." Alison has some really great - and realistic - advice for future bride's planning their day. "The best piece of advice I could give anyone is remember that it's your wedding day, even though you are surrounded by so many other people, its important to remember the little things. Also, don't get too drunk because the next day I felt hungover and didn't even drink anything. Also eat, we never got to eat and were starving. We came back home and I had to cook a pizza for my new husband." Congratulations, Alison, on your big day!! We loved getting to know you and are so happy we got to share your wedding! Check out more of her special day in the gallery below!